Eating strange things like wool or cotton can also be a disorder of the cat's natural hunting behaviour which is to stalk, pounce, tear off feathers and skin, and eat. Not only does skin and feathers pass through the cat's stomach, but the cat has an instinct to do the tearing and plucking before swallowing. Some pet cats get compulsive about this part of the predatory sequence – tearing off feathers and skin bit by bit and swallowing it all. Since ordinary cat food gives no chance of tearing and ripping, the cat looks for this somewhere else. Cats will tear and rip and then eat wool, cotton, paper, cardboard, wicker baskets and electric cables. Some cats go out and steal soft toys, bring them home and tear them – imitating the whole hunting sequence with teddy bear prey! The danger from eating wool etc is that the cat will suffer from an internal blockage. One Burmese had seven stomach operations to get rid of blockages caused by eating tea cloths and woolly jumpers. These wool eaters (often pedigree breeds kept indoors without a cat flap) need help urgently. Experts used to suggest feeding high fibre food, gristly meat and frequent meals in the hope that this would make the cats feel that their stomachs were full and they would have lots of opportunity to chew Now they suggest supplying something closer to nature – something for cats to tear and shred. Behaviourist Peter Neville suggests getting dead whole turkey chicks, day old chicks or dead whole rats sold frozen by pet shops for reptiles. If these aren't available try the frozen dead mice. Or if all else fails, see if you can buy hens with their feathers still on from a local farm shop. These should be the cat's main diet, eaten in a room like a bathroom where blood won't get on the carpet! If you want to add a little dry food on top of this (only a minority of the diet) do so in a foraging toy where the cat has to work to get the dried food out. 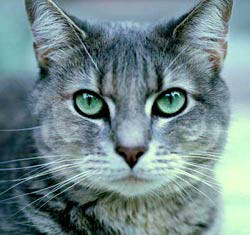 A vitamin supplement designed for cats and fed in the right quantities would do no harm. Although this whole idea is disgusting to humans, these may be the only way to cure these cats of what may be a dangerous disorder. Cats which have been wool-eating for only a few months may recover completely on this diet. Cats which have been wool-eating for years may occasionally wool-eat. Give it a month before you decide it hasn't worked – sometimes it takes a bit of time for the cat to realise it doesn't need to eat wool. It is also important to try and give the cat the chance to hunt. Most wool-eaters are indoor cats, so get a fishing rod toy or just a piece of string and try to give the cat 30 pounces on this every day. Never breed from a cat which eats wool – it may be a hereditary disorder. If you think there is something that triggers the cat to eat wool, start keeping a diary to see if it really is a trigger or not, and approach an animal behaviourist armed with this information. Note – day old chicks carry salmonella in their bowels, so wash your hands after handling them and do not let your cat lick around your mouth or hands after eating them. The risk of feeding them is probably no more than the risk that your cat might pick up a salmonella bug from mice or birds, but if you think your cat is ill, call your vet.